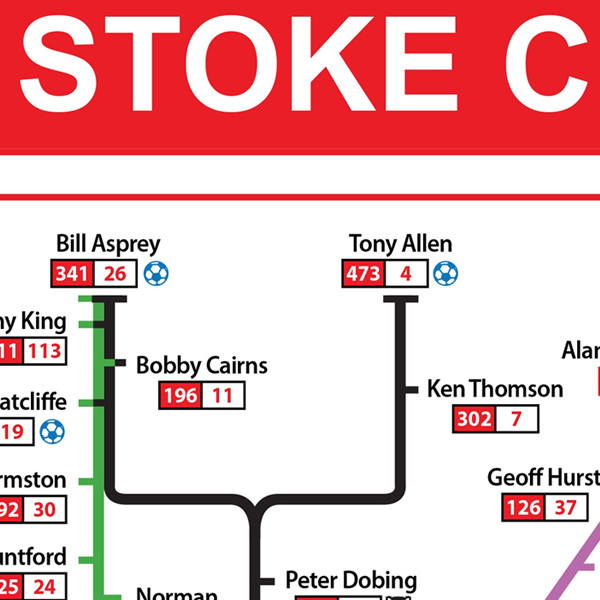 The History of Stoke City on an underground styled map. Each (coloured) line represents a period in The Potters history from their formation as Stoke Ramblers to the present day. Depicting all the major events in the history of the club, trophies, players, managers. Great detail including managers, player appearances, goals, trophies, City’s League Cup win and every promotion and championship. 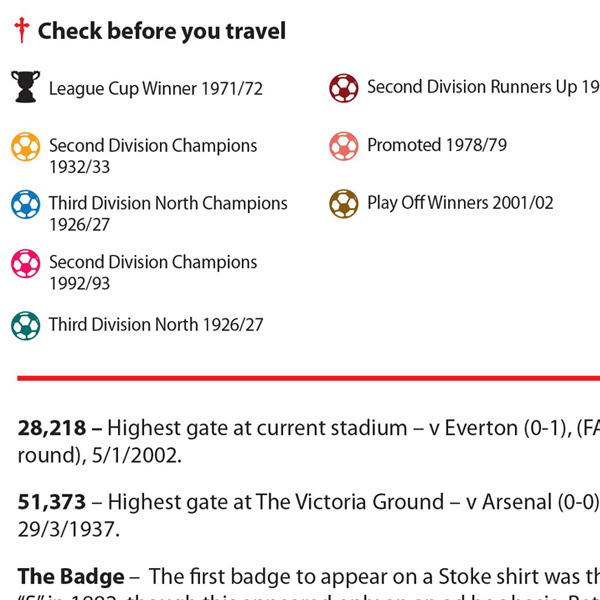 Information detailing the development of The Victoria Ground, The Britannia Stadium, the kit and the club badge. Extensively footnoted to include important events and people in the clubs history. Printed on 250 gsm art paper available in A3 and A2 as a print and is ideal for framing or just putting on the wall. 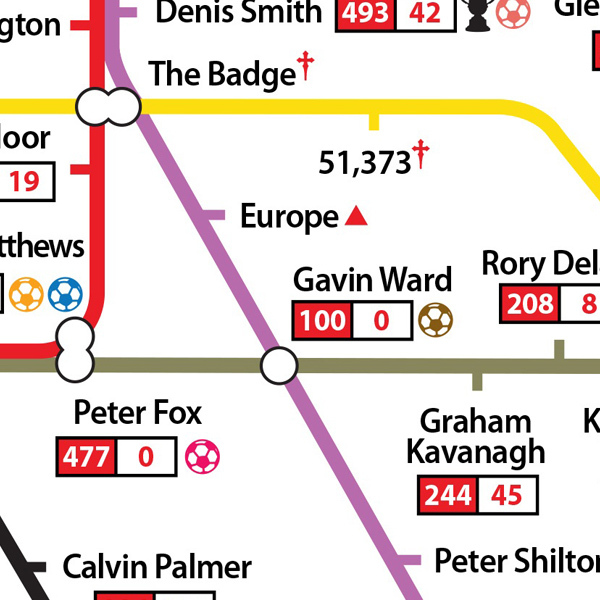 Full of vivid colours and a great combination of football history and the iconic tube map. The A2 size is particularly impressive for bedrooms, offices, landings and other larger areas. Priced at A3 – £24 as a print this includes postage to anywhere in the world. Priced at A2 – £32 as a print this includes postage to anywhere in the world. Please note the framing service is only available for UK customers. For your information regarding paper sizes – A3 (print is landscape) is 29.7 cms height and 42 cm long. (Two sheets of A4.) A2 is 42 cms high and 59.4cms width. (I would recommend an A3 for smaller walls, particularly recommended for toilets!) and A2 for larger wall space. 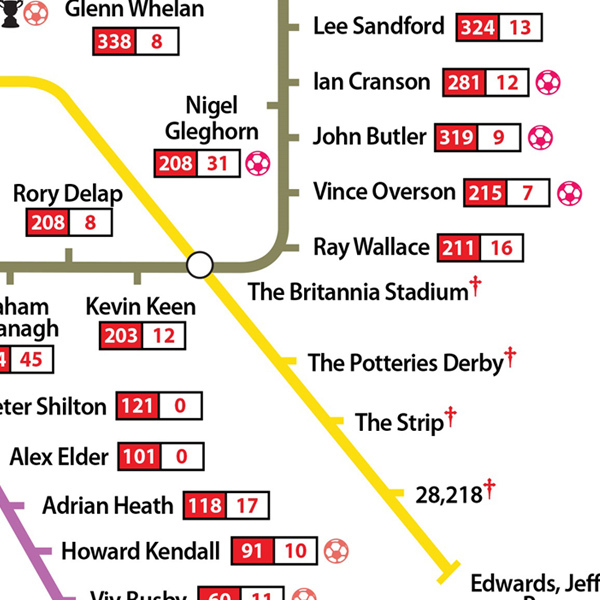 The History of Wolverhampton Wanderers on an underground styled map. A brilliantly coloured and highly informative map celebrating 5o years of England winning the World Cup. The History of Sheffield Wednesday on an underground styled map. The History of Chelsea Football Club on an underground styled map.